This week Buehler’s weekly ad circulars, coupons and specials. Every Buehler’s store circular features savings and promotions on grocery products. Find the latest ad specials on: Florida’s Natural Juice; Country French Bread; Buehler’s White Milk; Eggo Waffles, Pancakes or French Toast Sticks; Kellogg’s Mini Wheats Cereal; New York Garlic Breads; Our Family Applesauce Cups; Era 2X Liquid Laundry Detergent; Ragu Pasta Sauce; Chobani Greek Yogurt; Daisy Sour Cream or Cottage Cheese; Ore Ida Potatoes; Smart Ones Classic Favorites; Gillette Body Wash; Herbal Essences Shampoo or Conditioner; Taco Bell Original Taco Shells; Bone-In Western Style Ribs; Chicken Leg Quarters; Eckrich Smoked Sausage or Kielbasa; Porterhouse or T-Bone Steaks; Purnell’s “Old Folks” Sausage Rolls; Sugardale New York Beef Hot Dogs; Kleenex White Facial Tissues; Kraft Mac & Cheese Microwave Cups; Fancy Feast Cat Food; Cherub Tomatoes; Dole Salad Mixes; Fresh Blueberries; Peaches & Nectarines; and more. 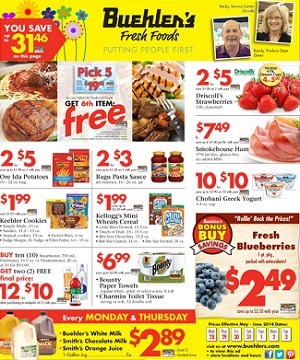 Buehler’s Fresh Foods stores activate their latest weekly circulars every Wednesday. Buehler’s Fresh Foods currently operates 14 stores in Ohio, including: Akron, Ashland, Brunswick, Canton, Coshocton, Delaware, Dover, Medina, New Philadelphia, Orrville, Wadsworth and Wooster. The grocery stores offer a convenient shopping experience that includes everything from meat, breads, dairy, pasta, fresh produce and more.